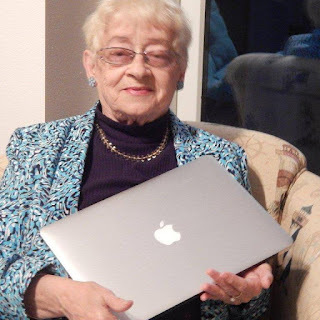 A Christmas gift from M. C Arvanitis. Please print it out and read it to your child -- Or let your older child read it. 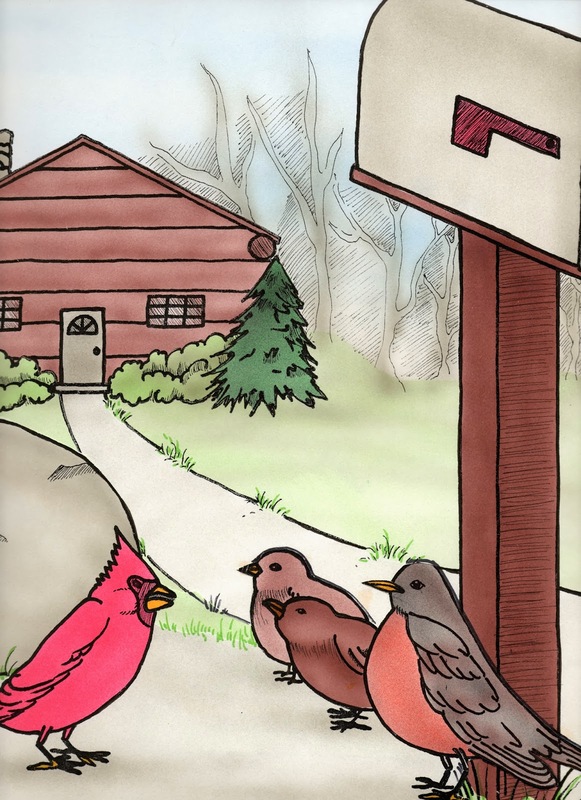 Reggie Cardinal watched the old man walk up the forest path from his house. The man had decorated his house with a green wreath on the door and lighted candles on his windowsills. 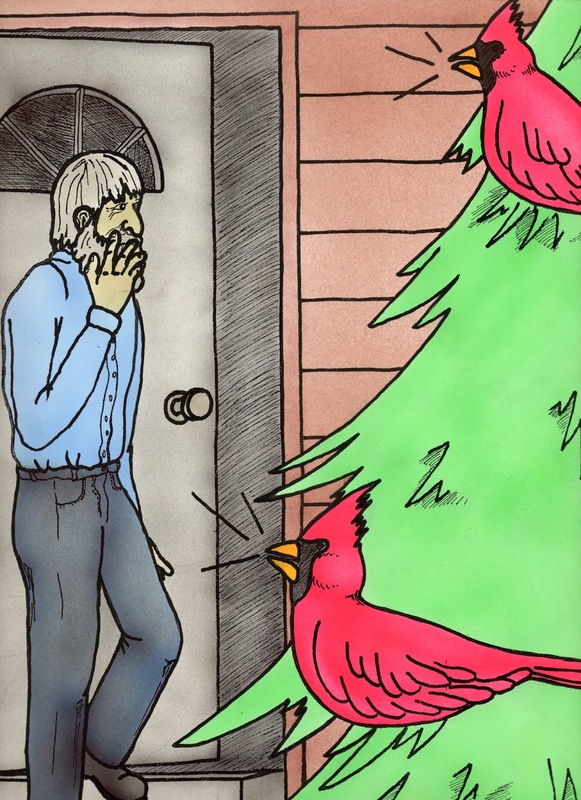 A little fir tree with red ribbons and glittering pinecones stood by the man's door. He carried a bag in one hand and his cane in the other. He stopped at the mailbox. With a joyful smile, the man pulled a letter from the mailbox. He lived alone and had waited all year for this letter that told him when his family would arrive for their Christmas visit. 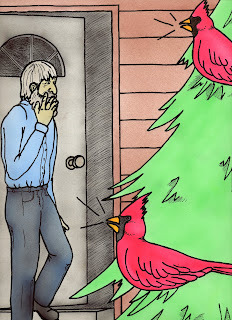 Reggie knew that even on the coldest days of winter the old man brought food to the birds of the forest. When the redbird heard the old man whistle for the birds to come for their treat, he joined the other birds on the ground. Blue jays grabbed the larger seeds and flew to the near by branches to enjoy their tidbit. Tiny brown juncos and yellow finches bravely flew among the bigger birds to get their share. Reggie watched him walk back toward the cabin, leaning heavily on his cane. The old man did not come to the mailbox bringing food for the birds after that. He took the wreath from his door and ornaments off the little fir tree. The candles in the windows went out. “We cannot. We must be on our way before it gets to cold for us here,” said the yellow finches. They flew away. “We cannot,” said the juncos. We are too small to help a human person.” They flew away. “We cannot,” said the jays. “If he is not gong to feed us we must find food somewhere else.” They flew away. “We cannot,” said the woodpeckers. “We must spend our time looking for insects under the bark of the evergreen trees.” They also flew away. Only the cardinals stayed. “How can we help?” they asked. 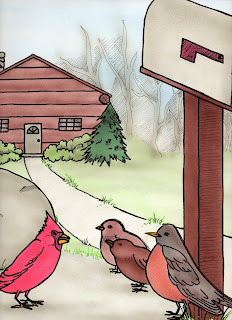 The redbirds perched themselves upon the little fir tree by the cabin door. More cardinals appeared. Soon red birds covered the tree from top to bottom singing their sweet song. He rehung the wreath on his door and placed the candles in the windows. Next he brought out his fiddle and played all the Christmas songs he knew. A loud horn blast sounded above the music. The station wagon drove down the lane with waving children hanging out the window. When the car stopped his grandchildren tumbled out with all the fixings for the Christmas feast. Tears of joy came to the old man’s eyes. Reggie watched as the man led his family into the cabin. 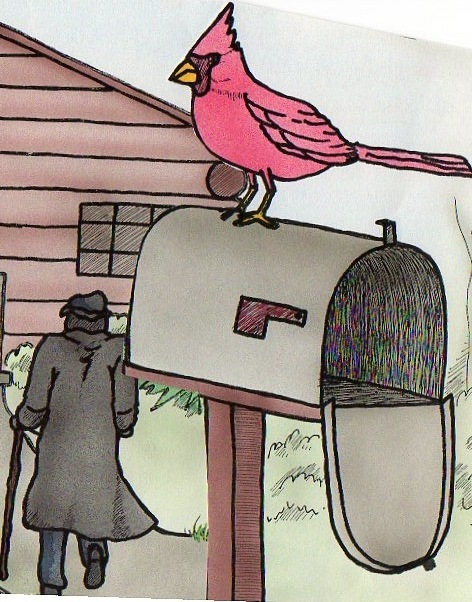 He knew there would be no feast at the mailbox until they left but he didn’t care. He was glad to see the old man happy again. 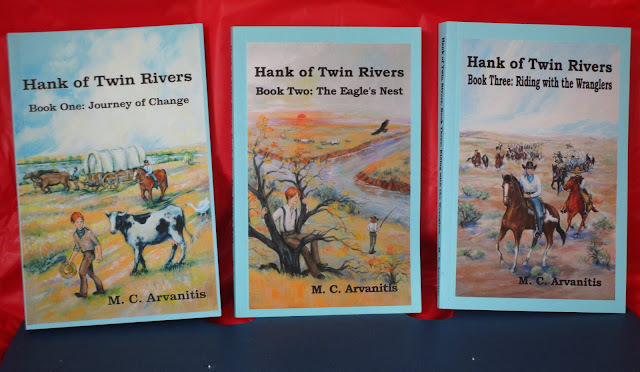 Ms Arvanitis is happy to announce she has finished her mid grade - to adult historical series, 'Hank of Twin Rivers', a saga of a motherless boy braving the dangers and trials of living on the merging Platte River. A coming of age story, Hank' grows from a 12 yr old shy boy dominated by his stern father to age 18 when he learns to choose his own way of life.